If you're looking for something a little different for that budget ground beef, this casserole recipe is an excellent choice. 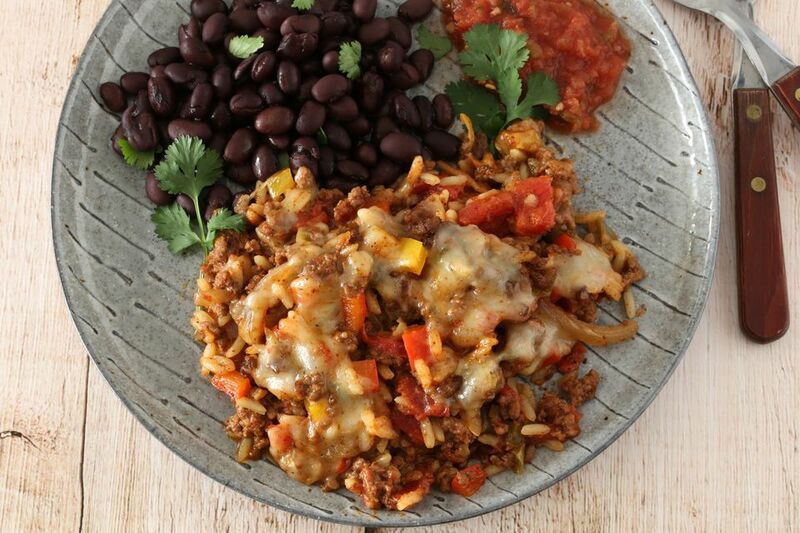 This easy ground beef casserole is a Texas-style hash that includes rice, onions, peppers, tomatoes, and Tex-Mex seasonings. The simple list of ingredients makes the casserole a cinch to fix and bake. Our Tex-Mex casserole is finished with a pepper jack cheese topping, which is optional. Or top the beef and rice with cheddar or a taco-seasoned cheese. Serve this easy one-dish meal with beans, a salad, and cornbread or biscuits for a satisfying family dinner. Heat the oven to 350 F. Lightly grease a 2-quart casserole dish. Place a large skillet over medium-high heat. Add the ground beef and cook, stirring, for about 2 minutes. Add the sliced onions and continue cooking until the onions are softened and the ground beef is no longer pink. Drain and discard the excess fat. Add the garlic and bell pepper to the ground beef mixture and cook for 2 minutes longer. To the skillet, add the tomatoes, tomato paste, cooked rice, chili powder, salt, and pepper. Stir to blend the ingredients thoroughly. Transfer the beef and rice mixture to the prepared baking dish and bake in the preheated oven for 20 minutes. If desired, sprinkle shredded cheese over the top of the casserole. Return the casserole to the oven for about 5 to 10 minutes longer. Remove the casserole to a rack and divide among four plates. Serve with beans, if desired, along with your favorite toppings. Make it Ahead: Brown the ground beef, onions, garlic, peppers, tomatoes, and seasonings and cook the rice a day in advance. Refrigerate the ground beef mixture and the rice in separate containers; assemble the casserole and bake it the next day. The ingredients will be cold, so allow extra time. Refrigerate any leftover casserole within two hours of baking and use it within the next three to four days. For longer storage, freeze portions in airtight containers. Label the contents and include a "best by" date four to six months in the future. Ground beef is an excellent choice for quick meals that are easy on the budget. Buy ground beef when it's on sale; brown the beef and freeze it in meal-size portions. Use the frozen cooked ground beef in soups, casseroles, chili, and other dishes. Pre-cooked "ready rice" is an excellent choice for this dish. Cooking fats can cause clogged drains; keep a container handy for fats. When the container is full, drop it in the trash. Spice the casserole up with some minced jalapeño peppers or a dash of cayenne. Or add some mild chili peppers for Tex-Mex flavor. Instead of plain unseasoned tomatoes, use zesty chili-seasoned tomatoes or tomatoes with green chili peppers.